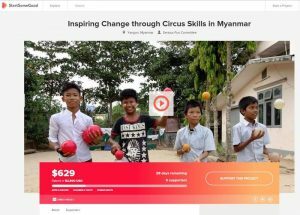 We have launched our new Crowdfunding Campaign to support Social Circus Myanmar in the dry-season project Nov 2016 – March 2017. You can help us achieve our goals with even a small donation. And just as importantly let more people know what we are doing! Spread the word and spread the serious Fun.